The BC Poultry Conference will be held at the Sheraton Vancouver Wall Centre. The reservation deadline has passed for the BCPC Rate. Please contact the hotel directly and ask if they can extend the rate to you - based on availability. Thank you and we look forward to welcoming you soon! The Sheraton Vancouver Wall Centre hotel offers both underground self-parking and valet services - height restriction (1.93m). Attendees who book their guestrooms under the 2018 BC Poultry Conference block will receive a discounted overnight self-parking rate of $20/night over the event dates (regular self-parking rate is $38.12 per day). Valet Parking is $41.93 per day. Parking space availability is on a first-come, first-served basis. 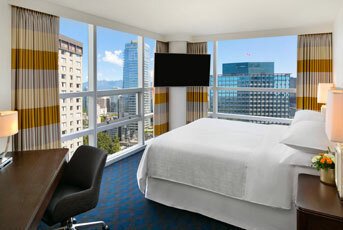 For directions on how to get to the Sheraton Vancouver Wall Centre, click here. Dogs are prohibited from all food and drink venues and grassy areas – public parks are nearby, a 5-minute walking distance from the hotel. Dogs are also prohibited from the lobbies, except during check-in or checkout and while entering an elevator.